This is a fascinating read from a Smithsonian writer about very early Navajo Silversmiths. PS I have a small wrist. What size is the sandcast bracelet in the photo featuring new items. I love the bracelet and am looking for one preferably in silver only. More thanks! Note from Paula: Reference Photos below of items mentioned in above email question. That sounds like a lovely plan, the layering. beads, the ones that are most like seed beads are the ones I showed in the photo above. So either one would hang just below your turquoise necklace. if I can answer any questions. Until then, happy holiday shopping ! Horace Iule (1901-1978) was a Zuni artist who made a wide variety of sterling silver and stone pieces, most notably traditional Zuni crosses. Horace worked with his wife Lupe Iule, who was from San Felipe Pueblo. They were married in 1933, and had six children: Ruby, Lupe, Cecilia, Robert, Barney, and Phillip. Cecilia continues in her fathers tradition with the crosses. Cecilia creates her crosses from tiny to huge and uses coral, turquoise, and other gem stones. Horace Iule was taught silversmithing by his father. He made sand-cast items and then embellished them with hammering and die stamping. His children use some of his original casting equipment to continue the Iule cross legacy. This is one piece of Native American jewelry my parents purchased from a dealer friend in Tampa back in the early 70s. I’ve been searching for days online and can’t find one just like this. I did find out that the marking on the back N.TSO indicates it was made by Nellie Tso, but can’t find out anything about her. I think it was made for a woman, but could be unisex. It’s 25″ in length (including the traditional clasp). The naja is 2-1/2″ wide and 2-10/16″ long. The blossoms, which I think may be sunflowers and are the unusual part of the necklace, are 1-1/2″ long and are attached to double bead strands. The weight is about 320g. If you have seen one like this or know anything about the artist. Thanks for any help. Marta C.
That is a unique and heavy sandcast……… squash blossom necklace ! I like it – it has a very pretty and unique design. It is hard for me to tell definitely from the photo but it seems to me that those are meant to be squash blossom flowers – if you have ever had a garden, you know what I mean – they are round and look like that. Here is an example from our pawn shop of that type of squash blossom flower. But note, the example I am providing below is not sandcast like your necklace is – but the flowers are very similar, aren’t they? Again, a guess from the photo – perhaps the pieces that project from the flowers are intended to be corn plants with corn leaves on each side. It looks like there is some texturing like kernels of corn. Is that so? Corn, squash and beans are the traditional mainstays of the southwestern diet, culture and symbolism are are used in many ways in art and ceremony. Nellie Tso, a Navajo, was a silversmith for the Atkinson Trading Company around 1980. She specialized in sand cast watchbands. The hallmark you describe is one of four ways she has used to sign her work. I hope this has been helpful. Enjoy your beautiful necklace ! To sand cast, you first must have one original pieces as the model or template. Using a special sand with a high clay content two halves of a box are filled with sand and packed. The template is pressed into the sand and the two halves are put together and pounded so that the sand takes on the impression of the original piece. The boxes are carefully separated and the model piece is removed leaving behind the impression. Sprues and air vents are added from the piece impression to the edges and the two boxes are bound together. Molten metal is poured into the mold. The box is separated, the newly cast piece is removed. Tufa casting is used by many Navajo casters today. Using a block of Tuff Stone, a porous rock from volcanic ash, Tufa Stone, a porous limestone that forms near hot springs, or Sandstone, a harder stone, the artist carves the design of the item being cast, taking care to make the edges angled in such a way that the metal doesn’t stick into corners. A sprue hole is carved into one end and another flat stone is placed against the carved half of the mold. The halves are fastened together. Molten silver is poured into the mold using the sprue hole. Once the silver cools, the item is taken out and finished. 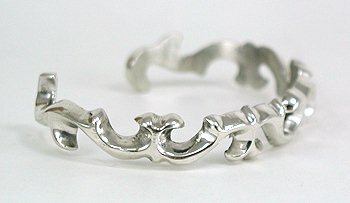 Sandcast sterling silver bracelets, like the one above by Francis Begay are poured flat and then shaped. Due to the porous nature of the materials used, cast items often will have character marks and imperfections such as small pits. That is the nature of Sand Casting and Indian Hand Made items. Some artists destroy the casting stones after each piece, others use them for several castings.